Oxygen isotope evidence for semi-aquatic habits among spinosaurid theropods. 2010. R. Amio, et al., Geology 38: 139-142. 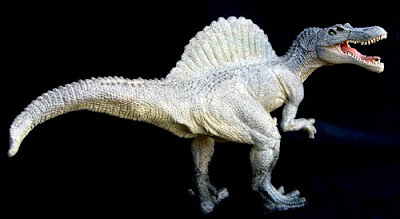 Abstract: Spinosaurs were large theropod dinosaurs showing peculiar specializations, including somewhat crocodile-like elongate jaws and conical teeth. Their biology has been much discussed, and a piscivorous diet has been suggested on the basis of jaw as well as tooth morphology and stomach contents. Although fish eating has been considered plausible, an aquatic or semiaquatic lifestyle has seldom been suggested because of the apparent lack of corresponding adaptations in the postcranial skeleton of spinosaurs, which on the whole is reminiscent of that of other large terrestrial theropods. On the basis of the oxygen isotopic composition of their phosphatic remains compared with those of coexisting terrestrial theropod dinosaurs and semiaquatic crocodilians and turtles, we conclude that spinosaurs had semiaquatic lifestyles, i.e., they spent a large part of their daily time in water, like extant crocodilians or hippopotamuses. This result sheds light on niche partitioning between large predatory dinosaurs, since spinosaurs coexisted with other large theropods such as carcharodontosaurids or tyrannosaurids. The likely ichthyophagy and aquatic habits of spinosaurids may have allowed them to coexist with other large theropods by reducing competition for food and territory.